First and foremost, Matt Lampson is a competitor. The 6-foot-3, 190-pound starting goalkeeper for the Ohio State men’s Soccer team makes no secret of that. Even going into his first season as a perceived fourth-stringer last fall, the redshirt freshman was confident that he would see the pitch. “I knew if I got the chance, I would take over as the starter,” Lampson said. It did not take Lampson too long to grab the starting reigns, and it shouldn’t surprise many that he did. He has been proving a lot of people wrong over the past three years. Lampson is the reigning Big Ten Co-Freshman of the Year and the Second Team Big Ten goalkeeper. He is also a cancer survivor. Lampson, 20, first began noticing a bump on his neck part way through his senior year at St. Charles Preparatory School in Columbus. He became worried when he was not allowed to donate at a school blood drive because his hemoglobin level was too low. “I went in [to see the family practitioner] and they tested the blood. They said, ‘Yeah, your hemoglobin’s low, but just take these antibiotics and you’ll be fine,’” he said. Lampson’s father, Chris, who is an anesthesiologist at Doctors Hospital in Columbus, suspected there could be more to it. Two weeks later, he had the lump biopsied. The results were harrowing. Lampson was diagnosed with stage four Hodgkin’s lymphoma shortly after graduation. Stage four is the most advanced form of the disease that takes the lives of around 1,300 Americans every year, according to the American Cancer Society. While many would be devastated by the news, Lampson had a different perspective. OSU head coach John Bluem, who coached at St. Charles from 1979 to 1982, echoed Lampson’s sentiments. Lampson had already signed a NCAA National Letter of Intent to play for Northern Illinois the next year, but that would have to take a back seat to months of intensive chemotherapy. Lampson, a pre-med major, was originally scheduled for four rounds of BEACOPP, a chemotherapy regimen that “centered around Cytoxan, which is the most intensive drug they had,” he said. BEACOPP, which stands for the drugs Bleomycin, Etoposide, Adriamycin, Cyclophosphamide (Cytoxan), Vincristine (Oncovin), Procarbazine and Prednisone, is a roughly month-long regimen where the majority of the drugs are administered through an IV on the first and eighth days of each round. Lampson lost all of his hair and gained roughly 60 pounds during the BEACOPP rounds. He couldn’t even eat ice cream because the treatment made his teeth hypersensitive. The most difficult part, though, was being kept away from soccer. As would any family, the Lampsons had a very difficult time seeing their son struggle. His mother, Mecy, accompanied him to all the rounds and his father kept a website chronicling the treatment. But, the Lampsons also aren’t the typical family. They have more than 20 pets — a number that is down from past years. To help their son cope with the rigors of each round, they got him a pair of King Charles Cavalier puppies, whom he named Hogkins and Nelson. On the morning of Sept. 24, 2007, Lampson went into Children’s Hospital for chest P.E.T. scans. His nurse returned later that afternoon with some important information. “My nurse practitioner, Faye, saw me and said she had some good news that my P.E.T. scans were negative,” he said. The doctors, however, recommended an additional two rounds of treatment to ensure the disease was gone. It would be another two months before he could start trying to get his life back on track. Lampson began training and playing with the Columbus Crew Academy in the spring of 2008, with many of his teammates from the Ohio U-17 team. He helped lead them to a berth in the Academy National Championship that summer before heading to NIU for the 2008 season. However, Lampson saw little playing time at NIU and grew disenchanted with the program as well as the distance from home. So, he decided to make a call to Coach Bluem. 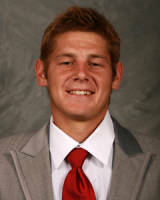 Lampson transferred to OSU in 2009 and began training with the team. He was originally expected to be a depth goalkeeper for at least a season. However, goalkeeper coach Taly Goode recognized that Lampson would not be content in a backup role. Lampson’s hard work paid off and he played his way up the depth chart and into the starting 11. “He came in and won the job, and I think with Taly’s work with him, he improved quite a bit over the season,” Bluem said. Lampson put up one of the top performances for a first-year keeper en route to the 2009 Big Ten Title. He went 10-4-3 on the season with nine clean sheets. Goode, who played three seasons of Major League Soccer with the Kansas City Wizards, said he thinks that if Lampson continues to improve, he might not have to worry about medical school. Even with the hype surrounding his first season with the Buckeyes and his potential future in the sport, Lampson tries to keep himself grounded. Lampson has certainly gotten some great opportunities to measure himself against the pros. Last week the Buckeyes fell 4-0 in a spring scrimmage with the Crew, a team Lampson will continue to train with during the summer. In March, the Buckeyes went on a 10-day trip to Spain where they scrimmaged four Spanish reserve teams, including La Liga giants Valencia CF. The Buckeyes went winless on the trip, but the experience was invaluable. Lampson and the Buckeyes will look to build on that style of play during training this summer and heading into the Fall Season. With eight starters returning from last year’s team, Goode knows the Buckeyes will be circled on most teams’ schedules. But, with some key senior losses on the back end, including Co-Big Ten Defensive Player of the Year Doug Verhoff, Bluem knows nothing is guaranteed. If anyone is up to the challenge, though, it’s Lampson.